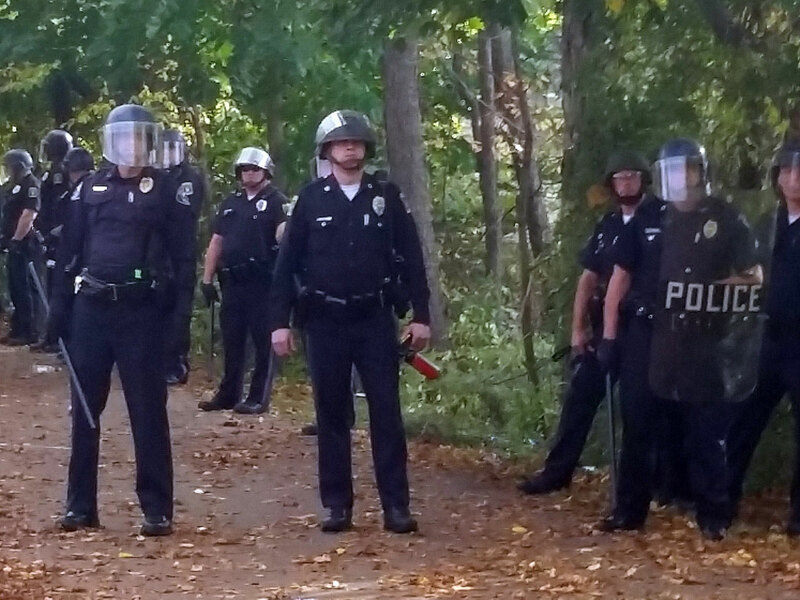 KEENE, N.H. - Disturbances lasted until early Sunday near Keene State College after an annual pumpkin festival erupted into mayhem and led to arrests, injuries and police in riot gear using tear gas. Keene State student Ellery Murray told The Boston Globe that she was at a party Saturday that had drawn a large crowd when people started throwing things. She said police responded in riot gear and used tear gas to break up the crowd. "People were just throwing everything they could find - rocks, skateboards, buckets, pumpkins," she said. "People just got too drunk." Keene State College President Anne Huot said in a statement obtained by CBS Boston that the school will hold involved students responsible for their behavior. "Despite the concerted efforts of organizers, city officials, police, and Keene State College, there continued to be disruptive behavior at parties in multiple locations around the city, injuries, and property damage," Huot said. "We deplore the actions of those whose only purpose was to cause mayhem." The parties around the school were part of the annual Keene Pumpkin Festival, where the community tries to set a world record of the largest number of carved and lighted jack-o-lanterns in one place. WMUR-TV in Manchester showed footage of a crowd toppling over a car, people running from tear gas clouds, street signs being torn down and fires burning in the streets. Police dressed in riot gear ordered crowds to disperse. College officials provided few specifics on the melee but said Keene State students and out-of-town visitors were involved. At least 30 people were injured near the school before evening Saturday, and 20 of them were taken to hospitals, Keene Fire Chief Mark Howard told New England Cable News. Twelve arrests had been made by that time. The Southwestern New Hampshire Fire Mutual Aid organization said on Twitter that several people were injured from thrown bottles at a party involving hundreds of people. Gov. Maggie Hassan said state and local safety officials worked to defuse what she called "the situation." Hours after the commotion broke out, emergency officials said they were still working the scene and couldn't provide any details. College President Huot said in an emailed statement that the festival has been promoted by others "as a destination for destructive and raucous behavior" and the college had tried on the front end, in working with the city and campus, to prevent this from happening.